Whether you are hosting a Christmas party for your family or having a Holiday Open House, this is a perfect dish to serve. It can be made in advance, served at room temperature, and your guests can serve themselves, allowing you to mingle and enjoy your company. I found this recipe in the Entertaining Guide to Victoria Magazine this past summer. Thinking ahead, I knew it would be wonderful for the Holidays. Caramelized pears, cream cheese, Gruyère, and roasted pistachio nuts--it is an all-in-one fruit, cheese and nut plate that pairs perfectly with a crisp white wine. The original recipe called for Neufchâtel cheese. I don't care for the taste of Neufchâtel cheese so, I went for the full fat. Hey, it's the Holidays! It also called for just four pears, but after making it for Thanksgiving, I thought it needed more. An added pinch of salt and this torta is mouthwatering! It is such a wonderful play on taste and texture. The pears are tender and caramelized, the cream cheese so spreadable and creamy, the pistachios are salty and crunchy and the Gruyère just adds that--je ne sais quois. You can serve this with your favorite cracker or crostini, but I highly recommend Carr's Rosemary Crackers. The Rosemary really brings it all together to make this the perfect sweet and savory dish. It looks elegant and tastes divine. I do hope you'll give it a try. In a large non-stick sauté pan, melt butter over medium-high heat. Add pears and sugar and stir until combined. Cook for 12-15 minutes until liquid thickens and pears begin to caramelize, stirring occasionally. Remove from heat. Transfer pears to a bowl and cool completely. In a medium mixing bowl, combine the cream cheese, Gruyère, and salt using a hand held mixer. Beat on medium speed until well combined. Line an 8-inch round cake pan with plastic wrap. Spread half the cheese mixture on the bottom of the pan. Spread half of the cooled pear mixture over the cheese. Spread the remaining cheese mixture over the pears. Refrigerate until firm, about 1 hour. Invert the torta onto a serving dish. Carefully remove the pan and the plastic wrap. Cover the sides of the torta with the chopped pistachio nuts and top with the remaining pears. Cover and refrigerate until ready to serve. Remove the torta from the refrigerator 30 minutes before serving. Serve with plain or rosemary crackers. Enjoy! 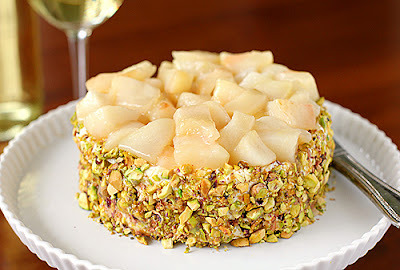 I recently made a blue cheese cheesecake with pear-onion jam that made an awesome savory cheese course, but this looks ridiculously delicious too - I know what I'm taking to my potluck cocktail party this weekend! This looks wonderful! I'd love to be at a party that was serving this. Thank you:) It is delicious! A bit of Poire William might be nice, too. Nicole, I absolutely love your blog. I made the Whole Berry Cranberry Sauce for Thanksgiving and we really enjoyed it-yum! I so look forward to reading your entries. I'll be making your Pear and Gruyere Torta tomorrow for a group of my retired teacher/school worker friends and have a question about the pears. Mine are pretty hard. Do they need to be more ripe or is it ok to use them as is? Thank you. I am pleased that you are enjoying my blog and recipes. As far as the Pear Torta--since your pears are hard I would suggest cooking them in the butter over a lower heat for a few minutes to soften then add the sugar and increase the heat to medium high and proceed with the recipe. I hope you enjoy it! I did make this delicious torta and everyone loved it! I cut the recipe in half since everyone was bringing something but it was definatly a big hit. Thanks so much. I am so pleased that you enjoyed it! Thank you for letting me know.